On the day that Intel secured the right from Psion to legally use the trademarked term Netbook, rival chip designer Qualcomm is pushing a “new” category of mobile device, which the company is calling a Smartbook. As a marketing term, like the Netbook before it, the Smartbook definitely has legs. It’s new, catchy and yet derivative enough of existing product categories so as not to scare off consumers. But beyond marketing, what exactly separates a Smartbook from a Netbook and other ultra-mobile laptops before it? Smartbooks are a new class of devices running mobile operating systems that bridge the functional divide between smartphones and laptops, delivering the best aspects of a smartphone experience on a larger-display form factor. Constantly connected via 3G, Wi-Fi and GPS , smartbooks are ultra-portable, personalizable, easy-to-use and last all day on a single battery charge. 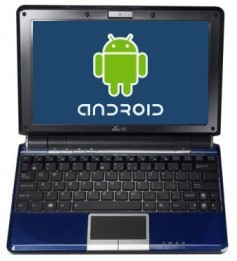 In other words a Smartbook is similar to a Netbook, except it runs a mobile operating system rather than a conventional desktop OS, such as Windows or one of the various desktop flavors of Linux. Qualcomm’s Snapdragon platform has a unique combination of capabilities that makes it exceptionally competitive in the smartbook category, which is redefining mobility for consumers at productivity and play. Other benefits of Qualcomm’s Snapdragon and the Smartbook category as a whole (presuming the company can convince us that it actually exists) is built-in 3G cellular connectivity and an ‘all day’ battery. Both of which a growing number of Netbooks already offer. Oh and now for ironic part of the whole story. As already noted, Intel today settled with Psion to use the term Netbook. Psion was the maker of a little known but much loved mobile OS called EPOC that powered mini laptop-like devices commonly referred to as ‘palm-tops’ but which had more than a little resemblance to what Qualcomm is calling a Smartbook. The best of which was the Psion Series 5. Psion then more or less abandoned the palm-top category (except for a sole product confusingly called a Netbook) as EPOC became Symbian OS, which in turn gave birth to the Smartphone. Therefore, the Smartbook isn’t anything new and easily pre-dates the Smartphone (and Netbook). And if history had been written a different way, Psion would actually be leading the “new” Smartbook category. Should Nokia release a Netbook? Therefore, the Smartbook isn’t anything new and easily pre-dates the Smartphone (and Netbook). Your right, in fact I had read that the smartbook had been in the works in for years and years it just never got mainstream acceptance. However this is all changing especially with the increase in mobile computing technology actually affording individuals the ability to do on they fly what they need to do without lugging around a laptop. Overall great article, thanks for posting, you should look at http://www.smartbook.asia I check all my news from there, it lead me here.